I have a US brand for you today that has stolen my heart with it’s simplicity, pure ingredients and beautiful formulas. 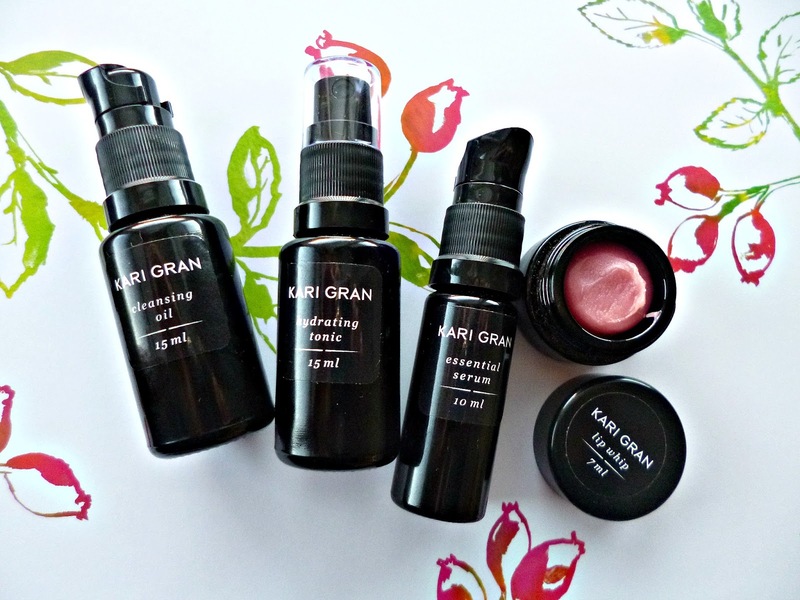 Say hello to Kari Gran who’s tagline is “The little black dress of Eco-friendly skincare” don’t you just love them already. I was kindly contacted to try some products and I immediately jumped at the chance as the brand had been on my radar for some time. Based in Seattle and founded by Kari Gran and her friend Lisa Strain, Lisa encouraged Kari to use the products she was making at her kitchen table for friends and family and turn them in to a business. The line has such a refreshingly simple approach to ingredients, everything is natural, organic or wild harvested and uses no GMO ingredients or possible endocrine disrupter’s. Every product is handmade in small batches and housed in sleek and protective miron glass which blocks out any harmful rays preserving the product fresher for longer. The Starter Kit is a great way to introduce yourself to the brand and you receive trial sizes of the cleansing oil, hydrating tonic and essential serum. When you have simple but effective ingredients lists I find this is often for me when skincare works it’s best, especially when the products in a range work together in harmony like is the case with Kari Gran. Starting with the cleansing oil which is a nourishing oil that cleanses whilst also hydrating the skin, the blend has sunflower oil, avocado oil, castor seed oil, lavender and vitamin E. The ingredients are so simple you could be tempted in to thinking that you could whip up something like this yourself, I have to say I tried and for some reason the Kari Gran offering seemed much more refined than my own, perhaps it was the percentage of the oils or perhaps the sourcing, either way don’t let the simplicity fool you this is a pleasure to use morning or night. Used at night this oil gently removes all traces of make up, I remove with a hot flannel and allow the steam to let the oils work in to the skin. Next after my skin is thoroughly clean I take the Hydrating tonic which comes in rose or lavender and spray it directly on to my face, you can also spray it in the palm of your hand and mix with the serum but personally I prefer to spray the face and then mix the serum over the top. I have the lavender spray which consists of aloe vera, glycerine and lavender oil and nothing more, there is no alcohol, no preservative and nothing controversial, the rose version is equally as simple replacing the lavender with rose. I am big fan of simple hydrating toners like this, I feel they prepare my skin best for serums whilst also having a soothing and calming effect, if you are after high tech ingredients then Kari Gran may not be for you if you are after good quality ingredients and simple, effective formulations then the brand has you covered. Last but not least for the starter kit there is the Essential serum, this serum is a deeply hydrating and contains a nice blend of oils especially for dry and sensitive skin like my own. The ingredients list is a little more complex than previous products but there everything is natural and easy to recognise, a few of the star ingredients include Camellia seed oil, rosehip, avocado oil, calendula oil and the essential oil blend including lavender, rose and Frankincense. The scent is light and sweet, really beautiful and not too overpowering and on my skin this is absorbed like an absolute dream, with no shine left behind just smooth soft skin. I have yet to find a serum I dislike but this one from Kari Gran has very much made the repurchase list for me. Full sizes are reasonable and ship for free within the US, as well as shipping internationally, a stockist closer to home would be nice but for now I can see myself purchasing directly from them when I run out. The last product I have to tell you about is the Tinted lip whip in peppermint, these lip whips have something of a cult following and I have to say all the hype is deserved. The unique texture is thick but almost airy in the pot and cushy and nurturing on the lips. The peppermint gives a slight refreshing tingle to the lips and the slight tint gives the “your lips but better” look that is so perfect for everyday wear especially when I am running around doing the school run in this cold. There are several shades to choose from as well as un-tinted version too, I can see these being totally addictive. I am glad to now be able to understand what all the US beauties where raving about when it comes to Kari Gran they are undoubtedly impressive and oh so sleek. You can also shop Kari Gran at The Choosy chick who ship Internationally.